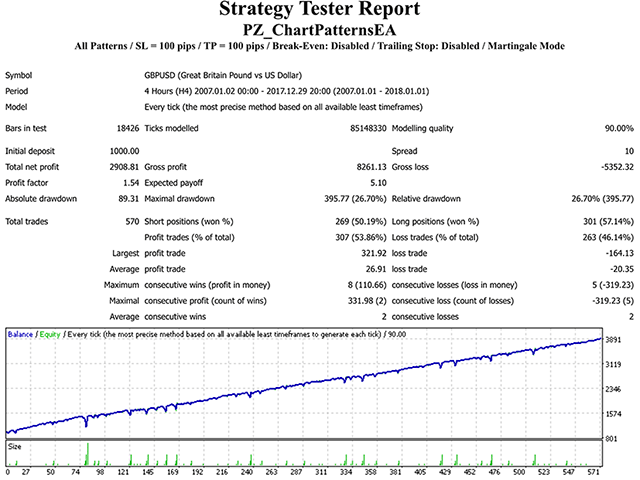 This expert advisor trades Chart Patterns, which are powerful and well-known price formations. It implements many other useful features for the exigent trader, like customizable patterns, trading sessions and days, several trading behaviors, a martingale and a inverse martingale mode. Trade Scenarios - Enable or disable chart patterns to trade at will. Supported patterns are Double Top, Double Bottom, Triple Top, Triple Bottom, Head and Shoulders, Wedges and Pennants. Those you disable won't be traded. Indicator Settings -This block groups the chart pattern parameters. Namely, size of the patterns to trade and the breakout period. It is recommended to leave the default parameters and only change them if you also have the indicators and are familiar with the impact of these parameters. Position Management - This group of settings applies to trading decisions and trade management. You can select trading direction, break-even in pips, break-even behavior, trailing-stop in %, trailing-step in pips, stop-loss in pip and take-profit in pips. Sessions Settings - Enable or disable trading for the Assian, European or American sessions, as well as trading week dayss, from Sunday to Friday. Money Management - In this settings block you can set the lotsize for the first trade, or allow the EA to calculate it by itself. It also implements a martingale behavior. Entering a manual lot size is recommended. You can enable or disable NFA/FIFO compliant trading.